From the moment you arrive at Huntley Santa Monica Beach hotel, you are immersed in a luxury seaside experience that perfectly reflects California’s relaxed yet refined glamour. Located in a residential pocket just two blocks from the beach and a short drive from Malibu, our Santa Monica beach hotel features 204 sophisticated rooms and 16 spacious suites designed by the innovative Thomas Schoos. Coveted amenities include rooftop dining at The Penthouse, 24-hour concierge service, and a modern fitness center. We are also a preferred meeting and intimate wedding destination with venues overlooking the brilliant oceanfront. Designed under the creative vision of Thomas Schoos, our luxury rooms and suites feature chic furnishings and amenities like 60” HDTVs, pillow top beds, Bvlgari bath products, and complimentary WiFi. 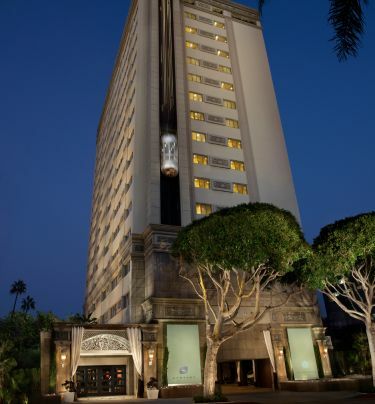 Read more about accommodations at The Huntley Hotel, the premier choice in Santa Monica luxury hotels. Boasting 360-degree views of the Pacific Ocean, Malibu mountains, Los Angeles cityscape, and even the iconic Hollywood Sign, The Penthouse is The Huntley Hotel's rooftop fine dining destination serving California contemporary cuisine. Read more about The Penthouse offerings. Whether you are planning a corporate board meeting or an intimate wedding celebration, The Huntley Hotel is a striking destination for memorable events. We offer over 5,000 square feet of flexible event facilities complemented by ocean views and inventive catering services. Read more about events at The Huntley Hotel. Our hotel near Santa Monica Beach conveniently places guests just two blocks from the sand and one block from the shops and dining of legendary Third Street Promenade. Iconic Los Angeles attractions are also a short drive away including the infamous beaches of Malibu, the Getty Museum and the star-struck avenues of Beverly Hills and Hollywood. Read more about The Huntley Hotel's location.